On January 14, 2015, Tommy Caldwell, along with his partner, Kevin Jorgeson, summited what is widely regarded as the hardest climb in history - Yosemite’s nearly vertical 3,000-foot Dawn Wall, after 19 days on the route. Caldwell’s odds-defying feat - the subject of the documentary film The Dawn Wall to be released nationwide in September - was the culmination of an entire lifetime of pushing himself to his limits as an athlete. This engrossing memoir chronicles the journey of a boy with a fanatical mountain-guide father who was determined to instill toughness in his son to a teen whose obsessive nature drove him to the top of the sport-climbing circuit. Caldwell’s affinity for adventure then led him to the vertigo-inducing and little understood world of big wall free climbing. But his evolution as a climber was not without challenges; in his early 20s, he was held hostage by militants in a harrowing ordeal in the mountains of Kyrgyzstan. Soon after, he lost his left index finger in an accident. Later his wife, and main climbing partner, left him. Caldwell emerged from these hardships with a renewed sense of purpose and determination. He set his sights on free climbing El Capitan’s biggest, steepest, blankest face - the Dawn Wall. This epic assault took more than seven years, during which time Caldwell redefined the sport, found love again, and became a father. 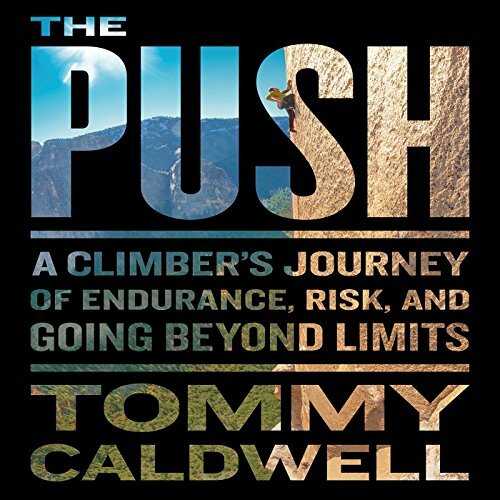 The Push is an arresting story of focus, drive, motivation, endurance, and transformation, a book that will appeal to anyone seeking to overcome fear and doubt, cultivate perseverance, turn failure into growth, and find connection with family and with the natural world. I was excited for this book, being familiar with Tommy's climbs and adventures. I've read countless similar books, and was geared up for another interesting, but somewhat superficial armchair adventure personal history. However, this book is instead one of the most thoughtful, introspective, and at times emotional personal stories I have read. Tommy has the ability to see the flaws and the grace in all the relationships around him in a mixture of love and honesty. The stories of his adventures are fun and descriptive, but also take pauses to discuss the thoughts, fears, and doubts in Tommy's mind at the time. He does an excellent job embodying his 15, 20, and 30 year old self so we can experience his growing up along side him. I am super impressed at this first book from Tommy- hopefully there are more to come! This is such an amazing and insightful story. Tommy Caldwell tells it with amazing detail, transporting us into the joy, agony and beauty of the mountains. I will listen again for sure. I couldn't put it aside! This would probably be something for non climbers just as well too! Wow, this was one of the best books I have read/listened to in a long time around the subject of perseverance and the will to make things happen. I cannot recommend this book enough and am really looking forward to the movie they were filming whilst scaling the Dawn Wall. My feet and fingers would get tired just reading about the climbs. Really well written and very honest without a lot of ego. One of the best memoirs, period. The book is painfully honest. From all the reviews I read and heard, I expected nothing but honesty, but still it surprised me. To a genuine person, it is not too hard to honestly dissect the self and even be brutally critical of oneself. However, it takes a strong commitment to honesty to tell the truth about EVERYTHING, which includes other people involved. It takes courage not to gloss over details for fear of offending others, and it takes integrity to speak the truth regardless how that reflects on yourself or others around you. For some readers out there, you might find the book sometimes painful to read -- that is, if you ever find yourself feeling hopelessly socially awkward and not knowing how to fit in and integrate, if you find yourself struggling to make sense of relationships be it with family, significant other, or even a climbing partner, if you have ever had the thought, no matter how brief and shameful, that walking off that diving board did not seem to be too horrible an idea, or if you have ever set a goal that seemed totally ridiculous and unrealistic ... you will identify yourself in the book. Now, who am I kidding. I am all of those "some readers" rolled into one. The fact that the book has a fairy tale ending -- everyone seems to have gotten what they wanted for life -- might just be the inspiration I need? You, ya you!, could well be in a very good place in your life right now and cannot relate to any of that. Good for you! I don't know what kind of impact the book will have on you, but I suspect that the book has the power to touch some place deep in anyone's heart. That, is the power of raw honesty. Enjoy! Enjoyed many aspects of this book. Well written with plenty of detail and definitions for non climbers to enjoy. Amazing autobiography! Experienced full range of emotions and left me more moto than my days in the military! Beautiful and moving, full of detail and depth. Loved every second,, like listening to someone reading poetry and magic. Tommy and The Push is performance perfection, perfect!!! Great story and narrator was spot on. Only negative thing was that couple of times I noticed some volume level changes, which kinda of dropped me out of the story and I had to rewind .. other than that, I loved it.